The first ceremony was held on June 4, 1970 at Cleveland State University. Others like it have since spread across the United States at which graduate and registered engineers are invited to accept the Obligation of the Engineer and to wear a stainless steel ring. The ceremonies are conducted by Links (local sections) of the Order. The Obligation is a creed similar to the oath attributed to Hippocrates (460-377 B.C.) that is generally taken by medical graduates and which sets forth an ethical code. The Obligation likewise, contains parts of the Canon of Ethics of major engineering societies. Initiates, as they accept it voluntarily, pledge to uphold the standards and dignity of the engineering profession and to serve humanity by making the best use of Earth's precious wealth. The Order is not a membership organization; there are never any meetings to attend or dues to pay. Instead, the Order does foster a unity of purpose and the honoring of one's pledge lifelong. 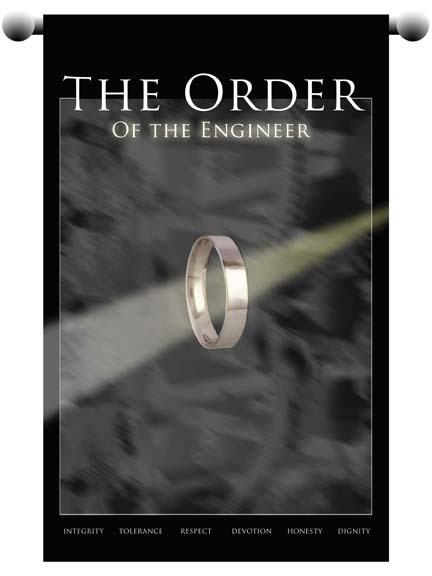 The Obligation of the Order of the Engineer is similar to the Canadian "Ritual of the Calling of an Engineer" initiated there in 1926. It uses a wrought iron ring, conducts a secret ceremony, and administers an oath authorized by Rudyard Kipling. The extension of the Ritual outside Canada was prevented by copyright and other conflicting factors.